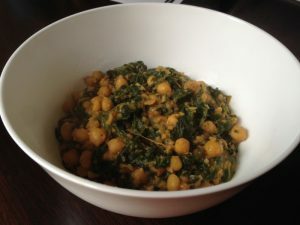 I haven’t been to Movida restaurant in Melbourne since my my pre-vegan days, but one dish that I ALWAYS ordered when I went there is this delicious, comforting dish of chickpeas and spinach. My garden often dictates that I need to find recipes based on a single ingredient that is suddenly in excess. At the moment it is spinach. The plants are starting to bolt, so I have harvested all the leaves and now I have a pile of it. This dish immediately came to mind. It is published in the Movida cookbook and has been repeated many times on the internet in various versions. Apart from a little veganising (replacing some butter with oil) this is pretty much unchanged. Drain the chickpeas and cover with fresh warm water and bring to the boil. Add a cup of cold water to stop the boil and bring back to a simmer. Let them cook until tender but not mushy. This can take anywhere from 40 minutes to 90 minutes depending on how fresh the chickpeas are. Remove the chickpeas from the heat and allow to cool. Drain and keep the cooking liquid. Heat the olive oil and fry the unpeeled garlic for 30 seconds. Add the bread slices and season with some salt. Fry the bread for around two minutes each side, or until golden. Remove the bread and the garlic from the pan and drain on paper towel. Allow to cool, then break the bread into 5cm pieces. Peel the garlic and discard the skins. Add the garlic and the bread, bit by bit into a food processor. Pulse until it forms medium to large sized breadcrumbs, about 2-5mm. Add a few chickpeas, the chickpea cooking liquid and some salt to taste. Pulse until the chickpeas begin to break up. Continue adding the rest of the chickpeas, adding a little more cooking liquid if needed and making sure you don't turn it into a paste. It should remain fairly coarse. Add the olive oil to a large pan over medium heat. Saute the garlic for a minute then add the spinach. Carefully turn the spinach over as it cooks until it has wilted down to about half of its original volume. This should take a couple of minutes. Increase the pan heat to high, add the chickpeas and the chickpea cooking liquid. Using the back of a spoon, mash some of the chickpeas into the spinach. Cook for five to ten minutes, then mix in the bread picada, letting it soak up the liquid. Add the paprika, cumin and a pinch of salt and mix. Reduce the heat to low and cook for five minutes, then add the sherry vinegar and cook for another five minutes, allowing the sauce to thicken to a creamy consistency. Sprinkle with sea salt flakes and serve hot. The bread picada recipe will make twice the amount you need, but it is easier to make this amount in a food processor. It will keep in the fridge for a week and you can use it to thicken up any kind of stew.